Class of 2022 student body officers—(from left to right) (top): Sarah McMahon (student rep), Sophie Strozier (student rep), Claire Nistl (treasurer), Claire Kurja (VP). (bottom): Jessi Cooper (president), Meryn DeSimone (student rep), Owen Bailey (student rep), Ryan Luo (secretary), not pictured: Grace Rebello (student rep). On August 28th, a wave of freshmen entered their new school— and a new community. 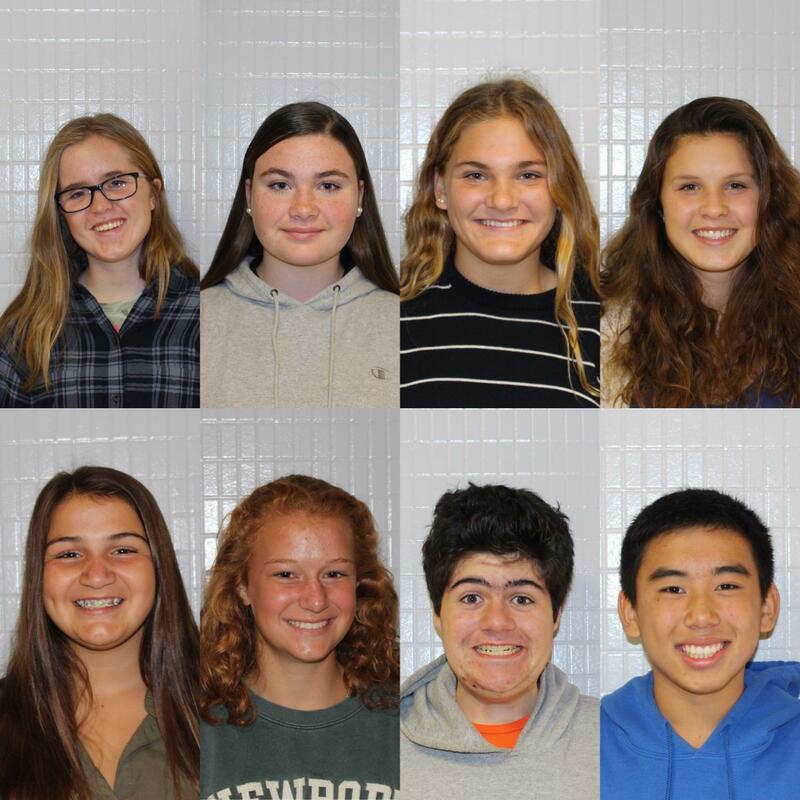 Each year of school brings different faces, personalities, and points of view with the incoming class. It’s easy for their older peers to ignore them and say “ugh, freshmen,” but with the Class of 2022 making up about a quarter of the student body, it’s important to hear what they have to say about the school. Students are already finding potential areas for change in the school. “I have noticed that the library has become less and less accessible to everyone, and I know that a big thing about coming up to the high school was that we were looking forward to going to the library and doing homework while with others,” said freshman student representative Sarah McMahon. Luckily, the freshmen have the opportunity to make an impact in the school through student government. Each grade has 4-5 representatives, as well as a president, vice-president, secretary, and treasurer that work to express the voice of their grade. At the beginning of the year, announcements are made on the intercom for freshmen to pick up their nomination sheets. Interested students pass around these colorful papers asking for the support of their classmates. Once they receive enough signatures, their next step is to write a speech for Election Day that sums up their ideas and plans for the school year. What causes a fourteen-year-old entering a new school—with a whole new schedule and new hallways to navigate—to decide to add the responsibility of representing the class onto his or her already heaping plate? “There was a lot of interest. This group of officers just wanted to serve,” explained Mr. Beckwith, the Class of 2022 advisor. On the day of the election, each prospective student officer walked up to the podium to address his or her classmates. The auditorium was filled with the entire freshman class staring at them, eager to hear what they have to say. It is not easy to speak in front of your entire student body and tell them why they should vote for you. Public speaking is known as the number one phobia, even outranking fear of death (BrandonGaille). Combining this with the discomfort of starting high school made Election Day even tougher for the candidates. It must’ve been an overwhelming experience, with the glaring beams of the theater lights shining down and the eyes of all their classmates on them. For a few moments before each speech, one could only hear the rustling of papers and the scratching of the microphone. After the speeches were complete, the potential officers had to face their next challenge: the nerve-wracking wait for the results of the voting process, which were announced that very afternoon. Once elected, the officers are in charge of organizing events for their class and raising money. While planning these occasions, the freshmen leaders hope to address the needs and ideas of their whole grade. “All of the student government officials are working on making sure all students have a voice in any kinds of decisions,” said Grace Rebello, a student representative of the freshman class. However, it’s not always easy to reach a consensus in a group of 137 teenagers who all have varying opinions. Even the seemingly simple task of picking class colors became a difficult decision that takes time and consideration. The student body officers debated back and forth between purple and white and purple and gold, trying to satisfy the requests of their classmates. As the year kicks off, the officers will have the ability to create a path forward for the Class of 2022. People often talk about how high school students need to be proactive in order to succeed, unlike Middle School where you can rely more on teachers. The same mindset can be applied to student government, as it’s now up to the freshman officers to create a fulfilling class experience for their grade. Ryan Luo said, “I definitely think that student government in high school has more responsibility, but also more freedom to coordinate events that people would like,” Luo said. “Freshmen are valued …you guys are coming in with a new set of ideas, that haven’t been here…we want you to share you guys to share your ideas, what kind of creative things do you want to become involved in as a class…you’re bringing new things to the table, and I think that’s exciting,” Ms. Rogal said.